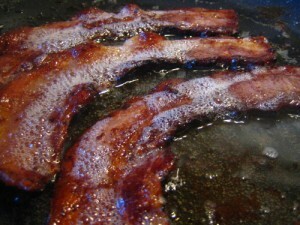 If you are looking for the easiest way to learn how to cook bacon then you only need to look as far as your stove-top. Place a pan on medium heat and wait for the pan to warm up. Then place bacon strips on pan and cook to desired level. This should take approximately five minutes. If, however, healthy is more important to you than easy, try using your oven. Use a cookie sheet and lay your bacon strips long ways and make sure each one is flat. Flavor your bacon with garlic powder or onion powder lighty before putting it into the oven. Preheat the over to 350 degrees and cook for about five minutes. Check to see if the bacon is cooked to your desired level. If it is not, then continue cooking for five more minutes until it reaches the texture you like the best. Carefully remove from the oven and do not spill the hot grease. Place the bacon on a plate covered with a paper towel to drain. Enjoy your bacon with the breakfast classics; eggs, and waffles!